What's better than a spontaneous dinner date before a night out to the theatre? An amazing spontaneous dinner date that fulfills a craving that you've had for months, and that's discounted through Groupon, that's what! There's been a new Lebanese restaurant in the neighbourhood that I've been wanting to try since it moved in months ago and today was the day. 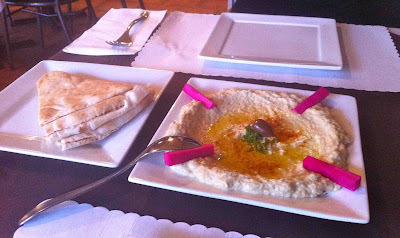 Naji's is a wonderful little place right by Bank Street and Second Avenue that has just brought a whole new world of flavour to the Glebe. Apparently, I have to come to terms with the reality that there is a compartment in my stomach dedicated purely to digesting falafels, and since it's been about a month since I had any, it was time to replenish its stock. Conveniently, right in time for out date night, I found a Groupon for Naji's and I was sold. With it being paper/marking/crunch time this year for anyone in academia, this is probably the most interesting thing I've done with food this week... though it made me really happy. 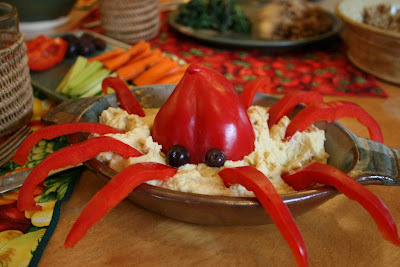 I give you: Fun ways to eat your hummus. Hehe... have a good week! So, remember back in November when I got so obsessed with the deliciousness of collard wraps that I ate them for a month straight? 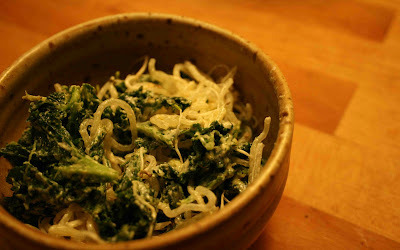 Yep, well, I've found my March food obsession: massaged kale salad with kelp noodles. OMG. Aside from the fact that I'm now eating kale salads for dinner about 4 times a week, the addition of the kelp noodles just sent me over the moon. 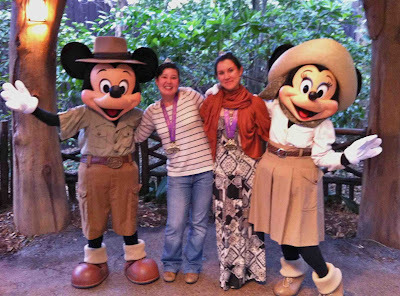 Already my last post on my culinary tour of Disney World, and the end of my perfect sister-bonding vacation... Five full days and two short half days in Disney World (counting the marathon) was really the perfect amount of time for us to be there. I think we could potentially have used another day to finish up some of the things we didn't get to do (mostly Tomorrowland in the Magic Kingdom, and a couple places in Epcot and the Animal Kingdom), but we definitely got to check all our favourites and more. 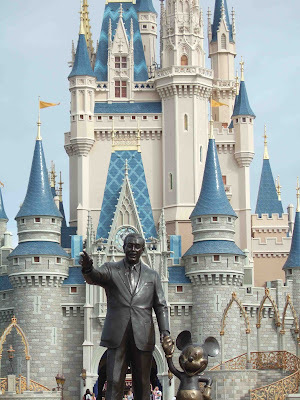 For Part I of my culinary adventures in Disney World, you can go here. Otherwise, let me take you through days 3 and 4 of my trip, which were probably by far the most copious! I think they have some kind of policy that no vegan will ever go hungry in their realm or something because, man, did they try to stuff me! I've always been a big pre-planner (though hopefully not to the point of obsessiveness). One of the big things I've found about going vegan is that it takes pre-planning to a whole different level. Whenever you go on a trip, most people can just think "so, what do I pack?" but one of the big questions in a vegan's mind, especially an organic-eating processed-food-avoiding vegan, always ends up being "so, will I actually be able to eat anything?" I can't believe all the magic was already a whole five days ago. I flew back into Ottawa on Monday night, and it's been hard to get back to a place where a) you have to wear a coat; b) not everyone cheerily smiles at you and/or calls you Princess anymore; c) buildings are no longer colourful idealized cute versions of what they should be, but instead are sad and grey! This was probably hands down one of the funnest trips ever. My sister is one the awesomest people EVER. 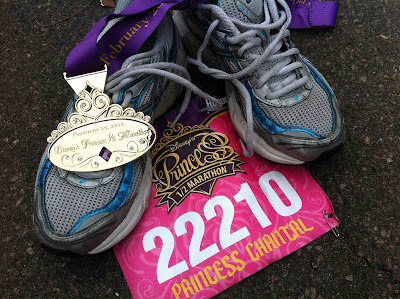 After deciding to run this marathon with my sister last spring, we had to go big or go home. The end result was 6 days in Disney World, complete with on-site hotel (the Port Orleans Riverside Resort, which I highly recommend) and park-hopper passes. I'll go through vegan options in Disney World over the course of next week (there were tons! ), but for now, let me cut to the chase: I did it!